In Dynamic Emergence you are a kaleidoscope of self-organizing, and yet inherently belonging, beingness. 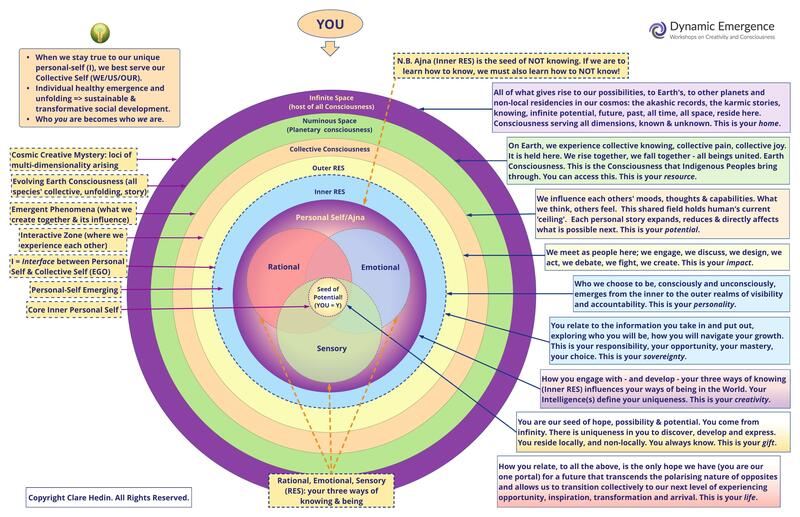 Take a look at this map and see how you fit into the universal cosmic order… how your creativity is an essential part of the cosmos’s ‘shape’ and identity, and how you being uniquely you is exactly what is needed at this time in our collective evolution. You can literally change the world by becoming your own best friend and alchemist – it’s an entirely practical and reachable goal, in a relatively short timeframe. You are part of the Creative Collective! And you are informed by so many layers of knowing and being. Just take a look. There is nothing ordinary about being a human, or about being on this, in this, of this, planetary experience. There is no distinction between our evolution, and Earth’s. Whatever we co-create in the Outer RES, whatever we take into our Inner RES, directly influences our potential in Collective Consciousness. This potential moves all the time – it is not fixed. So our work on ourselves is constantly engaging with the collective experience of being here, and continually (and literally) affects what can happen next.